Rainbow coloration varies widely. The same batch of rainbows grown at two different hatcheries can have noticeably different color intensities and patterns. For the most part, Maryland rainbows have a greenish silver back and a silver sides with a faint red band that travel the length of the lateral line. Rainbow trout were transplanted to Maryland from the West Coast of United States. They are native to the Pacific slope from the mountains in northern Mexico through the western United States around Alaska and the Bering Sea to the northern regions of Asia. The average size range of rainbow trout is 10-13 inches, with some individuals reach 20+ inches​. Rainbow trout are stocked in well over 100 streams and lakes across the state. Trout stocking locations and Current stocking information. In their natural range, rainbow trout are spring spawners and rely heavily on meltwater from high mountain snow pack to trigger spawning. In Maryland, far removed from their natural habitats, rainbows may spawn sporadically and intermittently at anytime between late summer to early spring. Rainbow trout take well to life in a hatchery as they are fairly disease resistant and easy to rear. Rainbow trout are the predominant trout grown at Maryland trout hatcheries and they form the basis of our successful put and take trout fishing program. Over 500,000 adult rainbow trout are reared annually at State trout hatcheries and rearing stations. 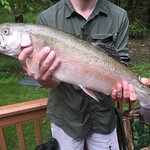 ​For more information on rainbow trout and their management, please contact Alan Klotz - 301-334-8218.